Looking for a truly unique, limited availability, VIP experience for Mother's Day? 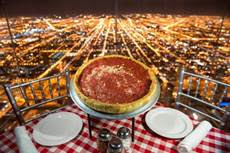 Skydeck Chicago’s Pie in the Sky experiences are a great way to celebrate mom from 103 floors up! The family can enjoy the world-famous Chicago skyline with Chicago style pizza on the 103rd or 99th floors of Willis Tower. Guests are invited to enjoy an exclusive dining experience on Mother’s Day at 10:30pm, after the after Skydeck Chicago closes to the public. At $100 per person, this three-course meal is catered by Giordano’s Pizza. Nine reservations are available to ensure a VIP experience. At $80 per person, guests can enjoy lunch at 12pm on the 99th floor, experiencing a spectacular view of four states. Pricing includes Fast Pass entry, a visit to the 103rd floor Ledge, and a three-course lunch. A maximum of ten reservations are available. Click HERE to book your reservations and see full details of the stellar Pie in the Sky offerings! Remaining reservations for this weekend must be completed by 5pm CT today (5/12/17).